What Are the Familiar Problems of Sand Dryer? At present, sand dryer is one of the demanding drying equipment. Generally, drum dryer is used when drying sands. In the working process, all sorts of problems would occur. Those who meet the problems for the first time, usually do not know how to deal with them. And if some of them can not be resolved efficiently in time, the lifespan of the dryer would be reduced, which further affects our normal production. 1. Material in the drum of the dryer can not reciprocate, so it will soon be pumped by the wind. As a result, the storage of material in the drum is too low, causing the reduction of dynamic and static contact areas between the material and the hot air. 2. In order to limit the speed the material moves toward the exit, the rotational speed of the drum has to be kept very low. 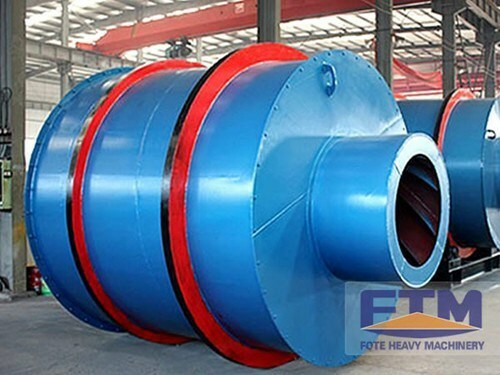 In this way, the frequency of the material in the sand dryer drum being raised is greatly reduced. Thus, the frequency of dynamic contact between the material and the hot air is also greatly reduced. 3. The wind speed in the drum is too low, causing relaxation of dynamic and static contacts between the material and hot air, which further leads to low efficiency of the drying equipment. 4. Only downstream drying, and the saturated water vapor in drying processes cannot be discharged in time, so that the interval of water vapor running in the drum is too long, resulting in water re-absorption by the dry material. 5. In order to improve the yield, the temperature at the entrance and the export is made too high, resulting in energy waste. Meanwhile, the quality of the material dried declines; the luster of the material becomes grim black; and there even are a lot of pastes. 6. In order to improve the yield, the drum of the drying equipment is made too long; and its diameter is too large. It can not be fully utilized; causing heat loss. Besides, the drying equipment covers a large area. 7. It is a mistake that the main part of the drying machine is installed in a inclined way, with the end near fire high and the far end low. This installation can only accelerate the speed material moves to the far end of the fire, so that the material storage in the drum is reduced again. In the whole drum of the cylinder dryer , thousands of raising plates, from the front to the back, spread at the same time, but the materials raised are few. At the same time, the design causes unnecessary obstacles to the installation and operation of equipment. Because of the tilt angle of the main part, its installation requires specifically a set of antiskid wheels to fix and to prevent the drying equipment from gliding in operation, which is very troublesome.